Most high school coaches want you to be prepared, schedule an appointment, and ask them what they think about their players. Head coaches at bigger schools especially want you to be prepared, but are also more likely to stay out of your evaluations of his players. 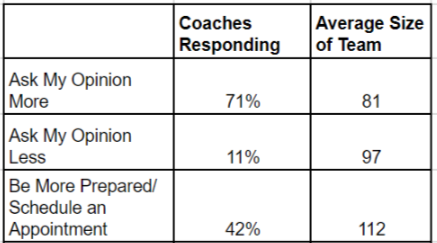 Not a single high school coach that responded to our survey would like college coaches to spend less time with them on high school visits, but half wanted college coaches to spend more time. When you do get in front of high school coaches, what do they want to talk about? While most coaches want to talk about recruiting or just hang out, coaches at the bigger high schools want to talk more X’s and O’s.This is a great way to make recruiting more fun and build the type of relationships that will establish your reputation as a great recruiter in that region, which will pay dividends down the road.